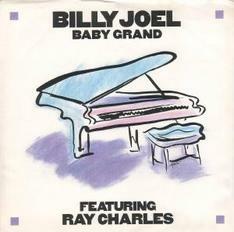 Billy reportedly wrote "Baby Grand" in just one night to record with Ray Charles, and it becomes an instant classic. What'd I say? The guy is a musical genius. © 1986 Sony Music Entertainment. ﻿"Baby Grand" is a bluesy jazz ballad that is an ode to the piano itself, as well as an homage to Billy's idol, Ray Charles. The song is a duet between the two piano men and was written specifically for this purpose. While it does not feel as heartfelt or authentic as "New York State of Mind" or Charles' own "Georgia on My Mind," it is still a worthy and satisfying composition. The Wikipedia entry for the song is so complete, there is not much else to say. Or you can listen to Billy discuss how the song came to be; click the player below (from Sirius XM radio). Despite the lyric that "no one's going to play this on the radio," the song was played on the radio and reached #75 on the Billboard charts. Ray Charles and Billy Joel. Columbia Records (1986). In 1999, Ray Charles inducted Billy Joel into the Rock and Roll Hall of Fame. See the video here. Billy's humble acceptance speech is shown below (right). Read Billy Joel's Hall of Fame biography, Read Ray Charles' Hall of Fame biography. Billy and an all-star band performed Ray Charles' "What'd I Say" at the 1999 induction ceremony, as well as a few other songs. It was an impressive class of Hall of Fame inductees that year. The other inductees included Paul McCartney, Bruce Springsteen, Curtis Mayfield, Dusty Springfield, Del Shannon (who had a big hit with "Runaway" (YouTube video), the Staple Singers ("I'll Take You There"), and The Beatles producer George Martin. Billy Joel gave his daughter Alexa the middle name "Ray" in honor of Ray Charles. She was born the year prior to the release of The Bridge. They sang "Baby Grand" together at a fundraiser in 2008, see video below. 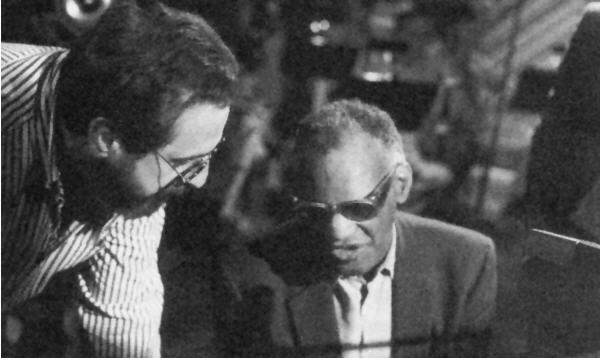 From The Bridge inner sleeve, Producer Phil Ramone and Ray Charles recording "Baby Grand" (1986). 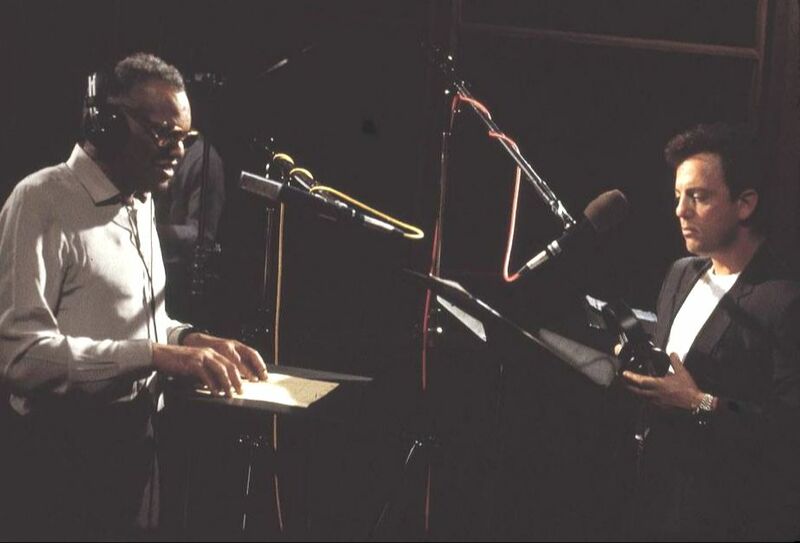 Billy Joel and Ray Charles recording "Baby Grand." Columbia Records publicity photo (1986). 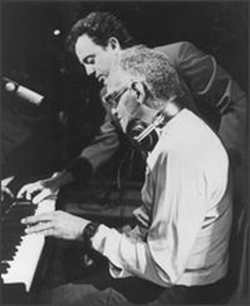 Billy discusses "Baby Grand," Ray Charles, and the piano, from "Building The Bridge" (1986). Billy and his daughter Alexa Ray Joel together singing "Baby Grand" at an Obama fundraiser in 2008. This is an audience video, and cuts off at the end. A complete version can be heard here though the video is shaky. DELETED. Billy sings "Baby Grand" on the Smithsonian special "Piano Grand" in 2000 celebrating the 300th birthday of the piano (Thanks to Violet Pearl for posting). Billy sings "Baby Grand" in Russia during his historic concerts in 1987. Billy Joel's acceptance speech for the Rock and Roll Hall of Fame in 1999, after Ray Charles introduced him. Alexa Ray Joel joins Billy at MSG on June 2, 2018 (eight years after their performance at the Obama fundraiser).